A lovely Single Malt for an after-dinner sip. It all started in 1911, when a boy was born in North-East of Scotland. His name was Alexander Murray, a true farmer that marched to his own drumbeat. He grew barley and sold it to local Single Malt producers. He loved Whisky and this love came through genes to Steve Lipp, his great-nephew. He established an independent bottling company bearing his great uncle's name. Based in LA, it searches for the next best thing and lucky for us, they are successful. This seven-year-old Highland Single Malt Scotch Whisky was distilled by a secret producer and it won a silver medal at New York World Wine & Spirits Competition. It’s a great find, too! Bon Accord was matured in ex-Bourbon oak casks and its golden color, sweet flavor and a strong finish calls for a cozy after-dinner sip with someone special. 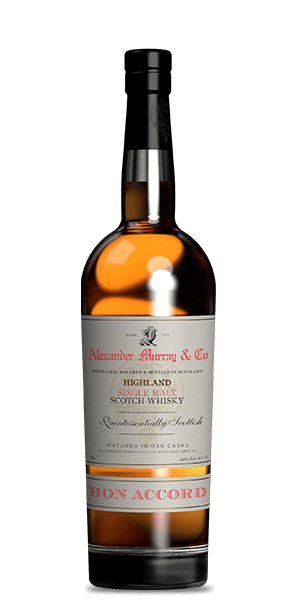 What does Alexander Murray Bon Accord taste like? The Flavor Spiral™ shows the most common flavors that you'll taste in Alexander Murray Bon Accord and gives you a chance to have a taste of it before actually tasting it. Gently smoky with sweet aromatic floral . Medium and sweet with colorful notes of walnuts, honey, vanilla and citrus on the palate.